In 1912, Judge A.M. Allen, an early Westport resident who gave him name to the Allen School and the Allen library, had to say goodbye to his much-loved home. “The Old Allen home,” known as the finest in Kansas City, had stood at the northwest corner of 51st and Wornall for 45 years. That home was torn down in 1912 to make room for a newer, bigger mansion for J.W. Aylor. Aylor’s expansive residence became the Sunset Hill School after his death. I can feel the pain of anyone who has to say goodbye to a long-loved home, so I understand how Judge A.M. Allen might have felt in 1912. He and his son had driven their buggy over to the northwest corner of 51st and Wornall to take a last look at Allen’s home of 45 years. Many had considered it the finest residence in Kansas City, but now the wrecking ball was coming for it. 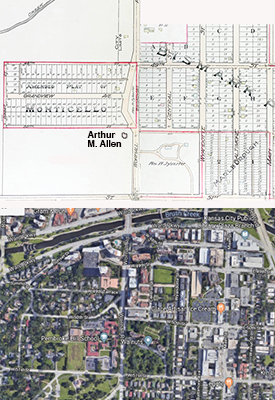 Top: a 1907 map of the A.M. Allen property. Bottom: a recent aerial view of the site. Arthur Mason Allen, an early resident of Westport, began teaching in the first school there in 1847. He later became a judge and a member of the Westport Board of Education, and helped form the Westport branch of the public library. He and his family lived in the yellow house for 45 years. The family also welcomed friends and relatives to the house. Just before the turn of the century Allen and his wife gave a lawn party for their daughter, Mary. The house was described as decorated with a profusion of ferns, with a punchbowl in the hallway surrounded by carnations. The lawn and veranda were gaily decorated with Japanese lanterns and inspiring music was provided for dancing, according to the KC Daily Journal on Aug. 6, 1899. As part of our Uncovering History Project, the Midtown KC Post is taking a look at each block in Midtown, including a set of 1940 tax assessment photos which is available for many blocks. (Many people seem confused by the tax assessment photos, which all include a man holding a sign. Here’s the story behind them). Today, the block from 51st to 52nd between Wornall and Summit. By 1912, the Old Allen Home was vacant, with broken windows and what a newspaper described as “a rather dismal air of neglect.” Several years earlier, Allen had sold his 50-acre tract of land (roughly bounded by 48th, 51st, Holly and Summit). In the intervening time, a wealthy businessman named J.W. Aylor had built a $100,000 home next to the Old Allen house, and was getting ready to move in. Aylor had a colorful history. He’d fought in the Civil War in the Confederate army, and then scraped together enough money to buy a horse for five dollars. He nurtured the horse and waited for the market to improve, and finally sold it for enough money to get to Jasper County, Missouri. Then his luck turned. Aylor bought a farm that turned out to be a worth a fortune for the minerals under it. He made a million dollars from the mining royalties, and accumulated one of the most extensive collections of paintings in the United States. Local art lovers were excited as his mansion on the old Allen property rose up; they were looking forward to seeing his art works as well as his new home. 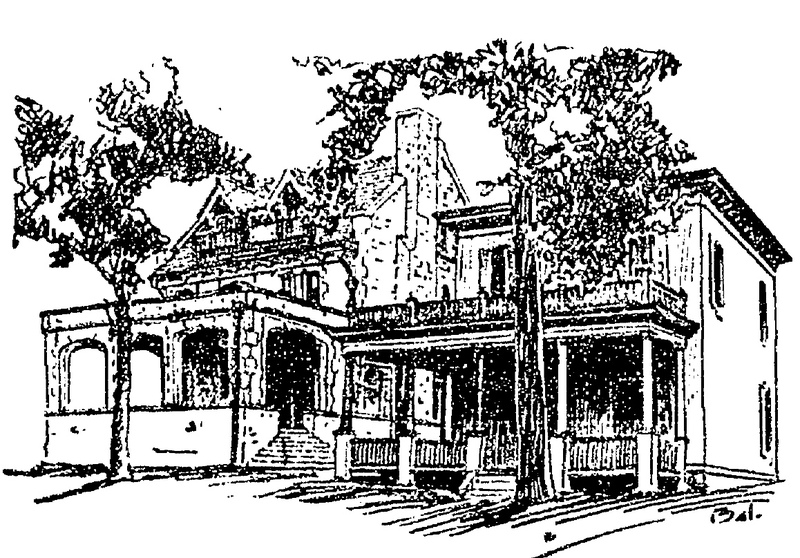 A sketch of the Aylor home before it was completed around 1912. Aylor hired architects Shepard, Farrar & Wiser to build a twenty-room, $105,000 Elizabethan-style mansion on the site. It was lavishly described as an English manor-style home of rough stone, 3½ stories high, with floor-to-ceiling shelves in the library, a Marie Antionette parlor finished in gold and white, a separate heating plant and vacuum cleaning plant, and a four-room garage. Much was made of one of the bathrooms in the mansion, said to cost $3000, with walls and floors of white Italian marble and fittings of German silver. The Sunset Hill School bought the Aylor home in 1919. What a sad story about Judge Allen’s house and then the new home as well. Glad the Sunset School is enjoying the structure.